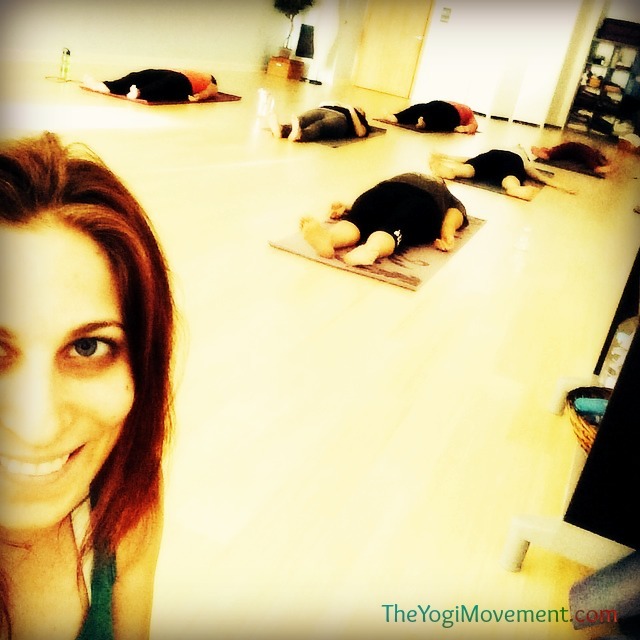 A few months ago, I taught a Start Your At-Home Yoga Practice workshop, which was a beginners Mysore practice. The purpose of the workshop was to teach how to take a full practice when you’re short on time, and at the same time, enough information to challenge yourself and deepen your practice on your own. Is it okay to switch around the sequence each day? What if Monday I do Sun Salutations, Tuesday I do standing postures, Wednesday I do some seated, and then Thursday all of the inversions? I don’t think that’s a good idea. The practice is a way for a reason. You want to do the same postures over and over in order to build awareness, and break negative mind patterns. This eventually leads to concentration, meditation, and happiness. If you’re skipping around, then you agitate the mind. If you’re really short on time, I think it’s okay to cut your Sun Salutations to Three A and Three B versus the traditional 5 & 5. This is a way you make an exception while still keeping the method. Even if you’re just doing Sun Salutations and the closing three postures, then you’re getting the full benefit. If you’re extra short on time, just sit and breathe for 5 minutes. At least practice the tristana: breath with bandhas, drishti, and posture (lotus in this case). This is still the full benefit because you’re keeping with the integrity of the practice. It’s not about doing all of these advanced asanas, but doing the practice in sequence using the breath, bandhas, and drishti. As long as you’re focused on that, you are accomplishing yoga. If you’re focused just on asana, then you’re doing gymnastics. However, don’t get in the habit of an extra short practice. Always try to make time for your full practice. Photo taken at Everything Zen Yoga in Orlando, FL during my class! When the workshop was over, I felt really happy about how it all went, and especially that I stuck to my beliefs rather than altering them to please someone else. Not to mention, that person paid money and was there to learn, so I can’t imagine they would want to hear a lie! This is something I constantly have to remind myself. This got me thinking about my responsibility as a yoga teacher, and all of qualities that embody the yoga teachers that I admire and have been blessed to work with. There are endless traits to cultivate, but below is my list of what I feel are the most important, and personally strive to radiate towards my students, and none of them have to do with advanced asana! 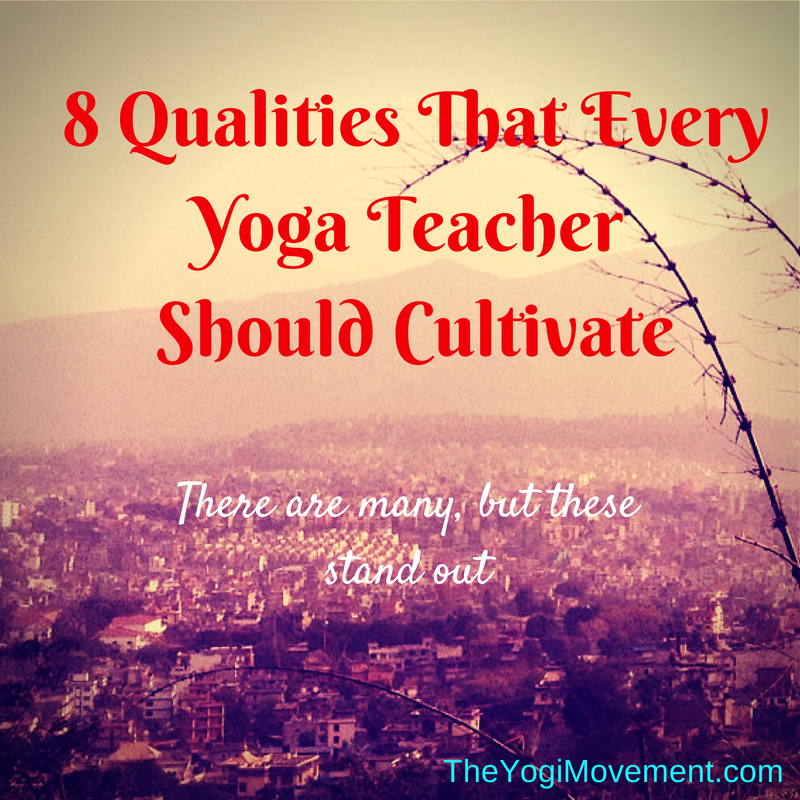 These are 8 important qualities I believe a yoga teacher should cultivate. What else? 1. Be Authentic: David Garrigues says that “Practice comes from a place of love, and not duty.” When I think of all of the teachers I’ve studied with, it’s the ones that kept a practice, were able to share their experiences, and teach directly from the lineage that I respect and trust the most. The teacher should have the intention to share the lineage because they want others to experience the life changing benefits that first inspired them. 2. Humility: It’s easy for a teacher to develop an authoritative and competitive point of view, but it’s important for the teacher to always remain a student, and teach with that attitude. Every teacher should be studying with a teacher (even if it’s just a few months out of the year), and every teacher should look to their students as their teachers. Every single one of my students has a different background and body. What they bring to the mat every day is also different. A yoga teacher’s responsibility is to share the tools they have developed to guide the student on the path out of suffering. I do my best to help by studying each student individually, and paying attention to what I learn in my own practice each day. Just as your students are surrendering to you, it will keep you humble as a teacher to practice the same. 3. Be Compassionate & Show Concern For Students: Experiencing injuries, aches, and pains have helped me cultivate a deeper understanding of compassion in yoga practice. I have had to modify and change my practice for specific injuries. I even had a surgery where I tried to keep practice, but couldn’t do many postures because my stitches could have torn. I used that time to meditate and cultivate patience. In going through this, I realized that I can teach others during pain and injury, but cannot claim to know what my students are feeling. I challenge my students, but never tell them to create or inflict pain. A teacher should always ask new students about any pain and injury, listen to them, and modify the practice to work with them on healing. 4. Have A Consistent Practice: A teacher should be a consistent practitioner of the lineage. In order to teach from the heart and be truly authentic, you should be practicing daily and following tradition. If you can’t practice what you preach, how can you stay authentic? The practice is your teacher, so it’s misleading to teach without it. 5. Have A Teacher: This is a post all on its own, but the student teacher relationship is extremely important. The practice is the ultimate teacher, yes. But, there is a reason for a yoga teacher. It’s so easy to let our egos control the practice. My friend Shanna has a perfect outline of excuses right here that we’ve all used: I’m tired, One time won’t hurt, I don’t feel like it, or I deserve a break. There are aspects that our ego might be convincing us of that we can not clearly see, and hinder our spiritual evolution. This is the primary reason I believe choosing and submitting to a teacher is important. 6. Lead By Example: Yoga is an 8 limbed path. Patanjali’s Yoga Sutras include moral and ethical guidelines for living a yogic lifestyle outside of asana practice. Although, we all have our own vices, it is crucial that the teacher does his/her absolute best to honor these aspects in their life and teaching. In the same respect, it is extremely important that once the teacher realizes their own vices, he/she is diligently working towards breaking the conditioned existence, and walking the path towards enlightenment through yoga. 7. Challenges the student: I can’t emphasize a student-teacher relationship enough when it comes to yoga. Working with someone individually over a period of time will help you to understand the students fears, strengths, and weaknesses. Not to mention, a healthy relationship will cultivate a mutual feeling of trust. Just as much as you have to be compassionate towards the student, you also have to challenge the student to work deeper. This will empower the student, letting them see that anything is possible, and help them get over their fears. The teacher needs to know when to push the student, and when to back off. Just like you do in any asana, how can you find that balance of effort and comfort in your teaching? 8. Non Attachment: You cannot be attached to your students! This is probably the hardest thing I hear from teachers. It’s like a break up really. Just like any relationship, you might have a student study with you for awhile, and move on to another teacher. Whatever the reason is, I try to remember that I was their teacher for that time for a reason, and hope that what they took from me was something fruitful that they still use on their path. It is possible to make a decent living while teaching yoga, but not easy, especially with so many teachers and studios opening all over. It’s not uncommon for a student to try a few teachers before they pick one. Teaching yoga, in my case Ashtanga Yoga, should be about passing down the lineage, and not materialism. However, I do believe that as long as you’re following you dreams, abundance will start to flow freely. Until then, I keep working to pay the bills, baby!